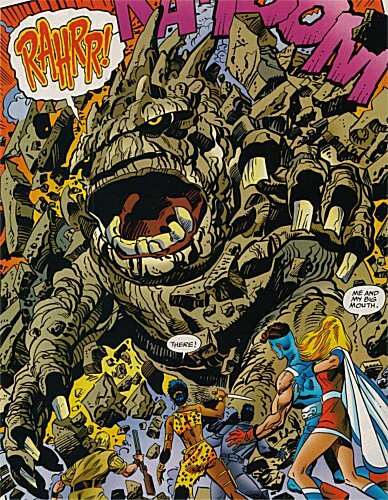 Powers/Abilities: In his mutated form Dr.Schreiber was a massive (15'-20'?) tall creature with rock-like skin impervious to small arms fire. He possessed large claws and superhuman strength to an unspecified degree. However he didn't appear to be particularly fast or agile, and his intellect was much reduced. In his human form, he was presumably quite a capable scientist, or else he wouldn't have been trusted to be part of a group studying an item as sensitive as a U.F.O. History: (MTLG#2 (fb) - BTS) - In 1958 Dr.Schreiber was one of a number of scientists tasked with examining a downed U.F.O. kept at a research center in Long Island. While inspecting a piece of equipment deemed to be harmless, Schreiber was somehow transformed into a gigantic behemoth. (MTLG#2) - The "horrible creature" Schreiber had transformed into crashed through the side of the research center, where it encountered several superhumans -- some had been brought there to investigate recent security breaches, but others (the Monster Hunters) had been led there by psychic emanations felt by Dr.Druid, which they thought might belong to a monster. The heroes fought the emerging Schreiber-creature, but found that bullets merely bounced off it. Luckily Schreiber spontaneously reverted back to human form after a relatively short time. Comments: Created by John Byrne, Roger Stern and Al Milgrom. 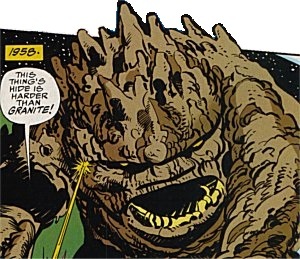 Since one of Schreiber's fellow scientists described the monster he transformed into as "that horrible creature", I suppose I should have named his transformed state "Creature" or "Horrible" in the grand Marvel monster naming tradition demonstrated by such stalwarts as the Thing and the Hulk. Dr.Druid read Schreiber's mind as he reverted to normal, and from the sound of it, Schreiber was unaware that Zuhn and his allies had broken into the center. This suggests his transforming when he did was coincidental, and not linked to the break-in -- if not, then Zuhn, Blackjack and Scythe could be added to Schreiber's enemies. 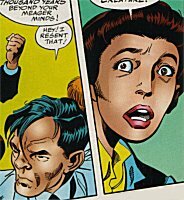 After Schreiber changed back to normal, Zuhn fought "Agent Scott" (secretly another Skrull called Velmax), who was the government operative who had called in Black Fox, Yankee Clipper and Liberty Girl. Zuhn shot Scott with a "bio-moleculizer", and fully expected his victim to change into another rampaging monster. As such, this was probably the device which transformed Schreiber, but it isn't confirmed. 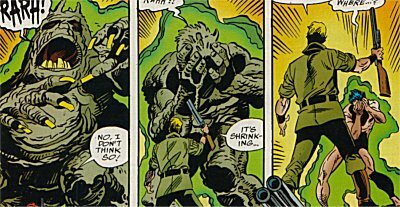 I've listed the heroes the creature fought as "former" enemies, because once Schreiber became human again, they ceased to be foes. However, I have to wonder if Schreiber's return to human form was permanent, or if he became the late 1950s equivalent of the Hulk. Three unnamed staff (presumably scientists) who worked at the Long Island research center. They were taken hostage by Zuhn and his allies, Blackjack and Scythe. At least one of them, the woman, witnessed Schreiber's transformation, presumably before being taken hostage. There is a close up of two of them in consecutive panels, but all we can tell about the third is that he was male and wore glasses. They were freed from captivity by the superheroes when they finished fighting Schreiber. All images from Marvel: The Lost Generation#2, page numbers listed minus advert pages.